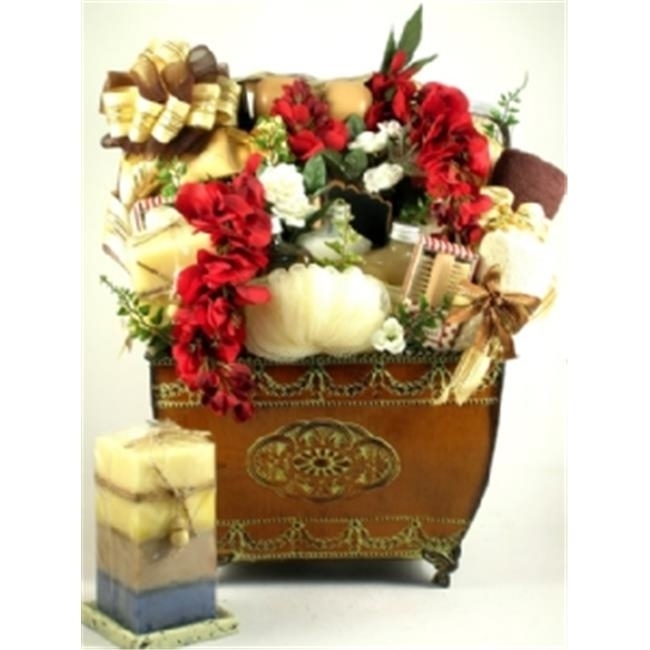 Our Serenity Garden gift basket defines elegance! Indulgent gifts to sooth and pamper her combined with this large and stunning planter make this spa gift basket one that she will be talking about long after it’s opened! Serenity Garden makes a luxurious gift for almost any occasion, personal and professional. Our Serenity Garden gift basket defines elegance! Indulgent gifts to sooth and pamper her combined with this large and stunning planter make this spa gift basket one that she will be talking about long after it’s opened! Serenity Garden makes a luxurious gift for almost any occasion, personal and professional. Her indulgent home spa treatment includes a decorative square scented pillar candle with stoneware candle holder, a set of Turkish Mediterranean washcloths, a mesh ex-foliating puff, a wooden two-sided manicure brush, a hardwood pedicure groomer, a gift boxed loofah and terry bath back strap, classic spa bath slippers, a gift boxed loofah cleansing body sponge, a bamboo massager with hand strap, a wooden back roller, white tea ginger bath salt designed to relax the muscles and soften the skin, white tea ginger bath tea, (both by “Souleve\' Spa” known for their fine quality and elegant style), creamy Pure Pleasure soothing vanilla milk scented body lotion, Pure Pleasure vanilla milk bubble bath, Pure Pleasure vanilla milk skin softening bath and shower gel, a hardcover floral journal, and indulgent chocolate truffles. This is all trimmed to perfection with silk flowers and ribbon and presented in this large (9\'\'H X 12-1/4\'\'W X 9\'\'D) and very elegant planter with an embossed medallion design.